There's not such a good reason that the email doesn't make clear why you can't unsubscribe. We all go looking for that button pretty regularly. So any email that has a relationship or transactional message - and therefore doesn't have it - should instead put, "You're getting this because we have to alert you that you've purchased 42 live newts and they're shipping tomorrow." And it should still point you back to other settings, so you can turn off other email settings for spite, etc. 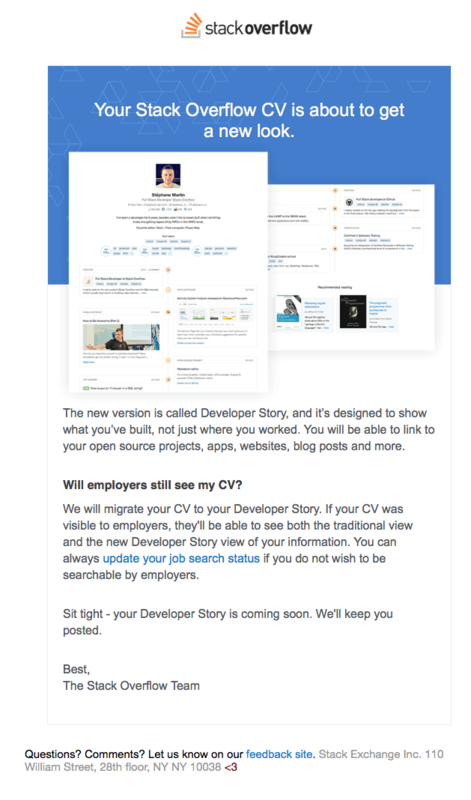 This change doesn't actually change your privacy in any way - Dev Stories will only be visible on the "main" SO profile if the CV was linked from there before. But the navigation changes make it feel more visible (it's a tab, vs a button that seems to send you elsewhere). Given all that, it's pretty clear users needed to be notified just in case they had concerns about privacy or wanted to change their settings. That's why the only bold header is about privacy, and the only call-to-action link is for privacy settings. But we still blew it by not making it clear why you can't opt-out of this kind of thing in the footer. That won't happen again. It looks like the issue here was that we have so few emails you can't opt out of (signup confirmation, etc.) that the "this is a one time email that you're getting because X" language may have been hard coded into them individually, and it just didn't happen here. Update: We realized that about a third of the emails were still in queue and hadn't been sent yet. We pulled those, so no one else will get one without the explanation. They'll go out next week once it's been added. Not the answer you're looking for? Browse other questions tagged bug status-bydesign developer-story email .